I spent a couple of wonderful hours last weekend with my sister visiting some vintage stores in Long Beach. She was looking for some props for a party she was helping with and I went a long for the fun. We found some wonderful things. She picked up some incredible stitched leather swivel bar stools (Ralph Lauren) for $100 each for her kitchen island (if I had an island I would have fought her for those!!! ), a couple of great jackets, a patent leather purse from the '50's that will be the perfect accessory to wear at her daughter's presentation ball next month, and a pineapple ice bucket to give to a friend who has a house on the beach. I had so much fun helping her shop. There were a ton of things I could have brought home myself but I showed great restraint. 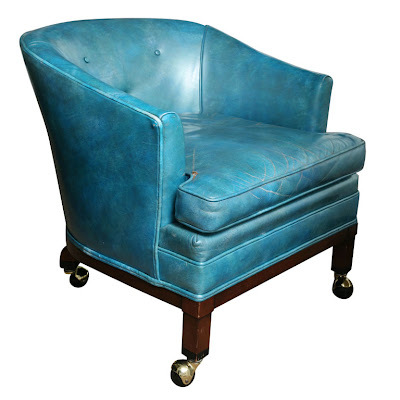 The hardest thing to resist was an old turquoise leather tufted chair and ottoman. It was one of those great statement pieces that don't come around often. And it was only $300. I could not justify it though; I had no place to put it. 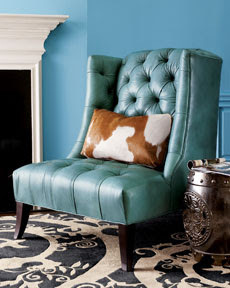 But oh ... even just the ottoman (and I do have a thing for ottomans) was worth the $300. I did come home with a copy of Architectural Digest from January / February 1975. Ah, what a great year! It is fun to go back and read those old issues and see how things have changed. And how some things have not. My favorite part was an article about the then Robert Redfords and their New York home. "Joining her husband with a tray of rose hip tea and honey, Mrs. Redford sums up her feelings about their New York home and her responsibilities as the decorator of it. "Our house isn't perfect, nor is it finished. I know I shouldn't have bought that rug there or this sofa, which somehow looked different when I picked it out. The mistakes are mine, but I don't mind. Striving for perfection, especially in something as subjective as a home, is an American hang-up. I think about what John Denver said to me - 'Perfection has nothing to do with not making mistakes.' I like that." I think I'll print that quote and tape it to my bathroom mirror - it's a keeper! Love the title. I feel our house isn't perfect OR finished...but I have got to stop spending money on it for a while (I say this as I am getting some new linen pillows made for the living room). Where did you go thrifting? LB is not too far from me. That quote is absolutely fantastic!! Love this quote! So,so true. 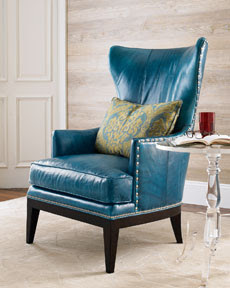 That chair is just beautiful ~ Glad you had fun! Wow.. That's a quote to not forget and to learn from! That quote is so perfect and reassuring!!! Coming from someone who had all the money in the world to do whatever she wanted in her house...thanks for sharing that...I was on spring break and I was checking in on you...I found just what I needed...Food for thought! Following you from A vintage Vine. Great post and words to live by! Hi I found you over at A Vintage Vine. Going to follow along now. Just came over from A Vintage Vine - love that quote! I often have to practice restraint, which isn't always fun. My house isn't perfect, but it's home :) Following along, thanks for sharing that quote!